Thank you for your commitment to empowering millions of women and girls. You are helping to ensure they have opportunities to reach their potential and build healthier families and communities. Your support of a full range of interventions—from water, food, health, and education to economic development and child protection—allows communities to work toward solutions, improved lives, and renewed hope. More than 60 percent of people living in extreme poverty are women and girls. 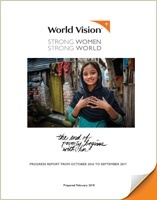 World Vision is responding in many of the communities where women and girls struggle the most. Solving the puzzle of poverty requires a full plan and a full range of services—water, food, health, education, economic opportunities, and child protection— in partnership with faith leaders who promote gender equality. 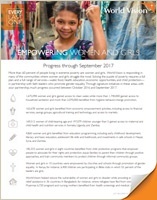 Through signature initiatives in these areas, with your partnership, much progress occurred between October 2016 and September 2017. Channels of Hope (CoH) for Gender is an innovative approach to exploring gender identities, norms and values from a faith perspective. The program methodology challenges faith leaders to acknowledge and act upon gender injustices in their communities, as these are realities in many places where World Vision works. 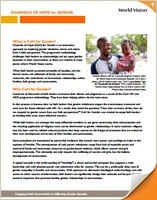 When faith leaders promote principles of equality, and the shared access and utilization of family and community resources, this contributes to harmonious relationships within families, faith groups and communities. 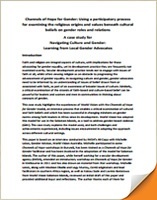 Faith and religion are integral aspects of culture, with implications for those advocating for gender equality, yet in development practice they are frequently not examined overtly. 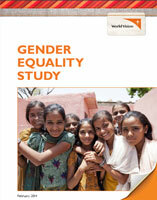 In June 2012, World Vision International commissioned an 18-month gender equality study to examine our influence on and contribution to gender equality for boys, girls, women, and men. The research took place in four countries (Kenya, Tanzania, Bolivia, India) and discovered a number of significant positive findings. 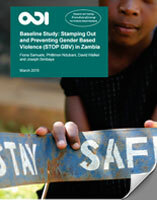 Gender-Based Violence: Survivor Support (GBVSS) is our USAID- and DFID-funded project that aims to strengthen the prevention of and response to GBV in Zambia.